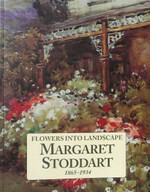 Chronicling the life of Margaret Stoddart, arguably New Zealand's best-known flower painter. It is a must for collectors of women artists or historical paintings. Text is by Julie King, University of Canturbury and the volume contains 72 colour plates, a chronology and exhibition history. This is the publication which accompanied an exhibition of the same title curated for the Robert McDougall Art Gallery (now Christchurch Art Gallery).